This is Part 1 of a seven part series presenting 28 of the best and most fascinating Ligurian villages of every type - hill towns and castle towns, walled towns and fishing villages. 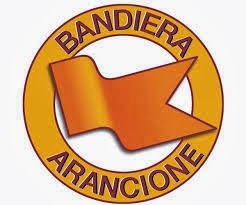 Each of these small towns has qualified for membership in one of two nifty Italian organizations: The Most Beautiful Villages of Italy I Borghi Piu Belli d'Italia - and The Orange Flags Bandiere Arancioni. Read about these initiatives below in More Info. You can see all 28 towns on this Google map: Beautiful Villages of Liguria Map and they are listed below as well. They are described from the French border toward La Spezia so you can easily integrate these beautiful towns with visits to San Remo, Portofino, Genoa, or the Cinque Terre. Each of these charming villages has a story to tell and some friendly people ready to tell it. While you can't tour them all, just visiting a few will add an authentic Italian flavor to your trip to Liguria. If you want to get off the beaten path in Italy, these villages will do it. Easily accessible from Ventimiglia, the village of Airole still has an ancient plan of concentric circles of narrow streets around a harmonious historic center. This town of close-packed houses features The Museum of Oil and of the Farming Civilization, an ancient communal baking oven, and a naturalistic path along the perimeter of the medieval town. There are three historic watch towers - the Towers of Olivè, Vio and Garbae - and the baroque-steepled parish church, the Sanctuary of Our Lady of Graces. Traditional wine cultivation is a local point of pride. Ancient stone walls have been re-built to provide for vineyards on the rocky ground, and the old methods are followed carefully, such as at the vineyard A Trincea. Hikers should take advantage of an extensive trail system which can be accessed at Airole Hiking Map There are a few pleasant places to eat, but with a population of less than 600, they may not always be open. Airole is noted for its friendly tourist information service, and the town website is at Airole Comune. Airole can be reached by bus Monday-Saturday from Ventimiglia on Linea 3. On the Riviera Trasporti Website click on Orario and then Orario Generale for the current schedule. There are about 8 buses a day. Airole also has some train service, connecting at Ventimiglia: Trenitalia. 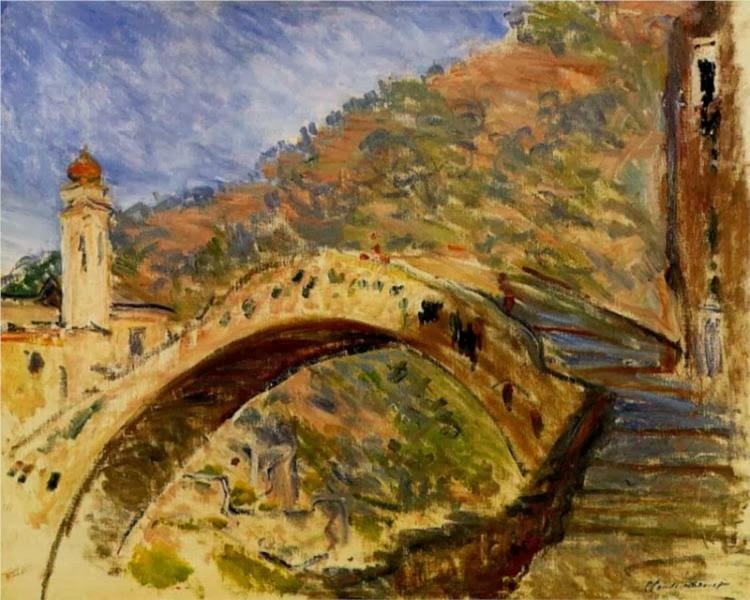 Dolceacqua Bridge Claude Monet, 1884. This pleasant village is well located on the Nervia River just in from the coast. The town's most attractive feature is the old medieval quarter called Terra which is topped by the looming Doria Castle. This area of narrow old streets is very evocative - in part because an ancient real estate squeeze caused buildings to be built as high as six stories! Monet's paintings from 1884 have made the village an icon of this part of Liguria. His 'jewel of lightness' - the 15th Century Ponte Romano - crosses the Nervia River with a single 33 meter arch (!) to connect ancient Terra with the somewhat less ancient Borgo quarter. The Doria family acquired the town in 1270 the easy way - they bought it. They used and improved the castle for over 500 years until the 1700's when they switched to the Palazzo Doria in the lower town In 1887 an earthquake inflicted serious damage on the Castle. The Church of Sant'Antonio Abate has origins from 1400's but looks younger due to baroque renovations. 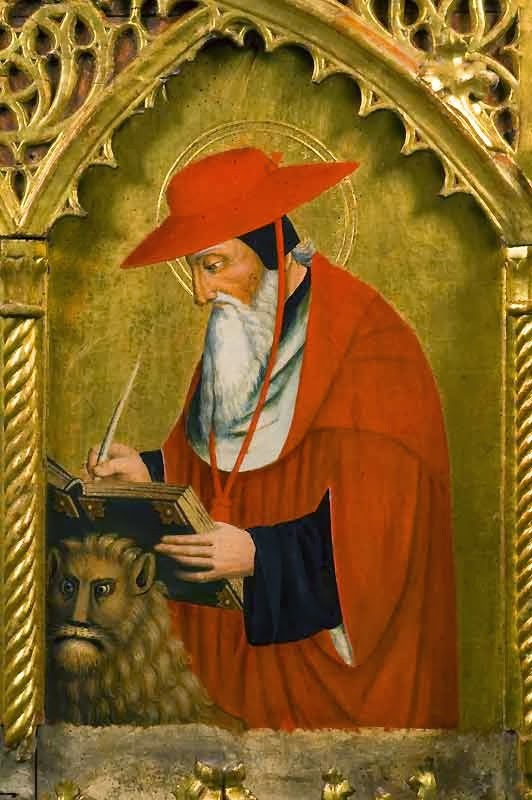 Inside is the Santa Devota (Holy Devotion), a polyptych from 1515 by the noted Ligurian artist Ludovico Brea. Several Doria ancestors are buried in Dolceacqua in the Church of San Giorgio. The town website can help with questions: Dolceacqua Comune. An excellent town to use as a base since it is close to the area's attractions, it has sufficient services, and it's very pleasant and welcoming. Dolceaqua is not heavy on hotels. Before you reserve a room, check the map to be sure it's walking distance to the center. Here's the best selection: Dolceaqua on Booking.com. Dolceacqua can be reached by bus Monday-Saturday from Ventimiglia on Linea 7. On the Riviera Trasporti Website click on Orario and then Orario Generale for the current schedule. There are about 12 buses a day and there are several stops (fermata) in Dolceacqua, all on the main road. "Its happy location is the origin of the name , derived from the latin apricus , exposed to the sun , but the main feature of the town, which has long enchanted visitors, is the spectacular appearance of the town - a sinuous cascade of old stone houses stretched along the ridge of a steep slope dominated by the Castle. 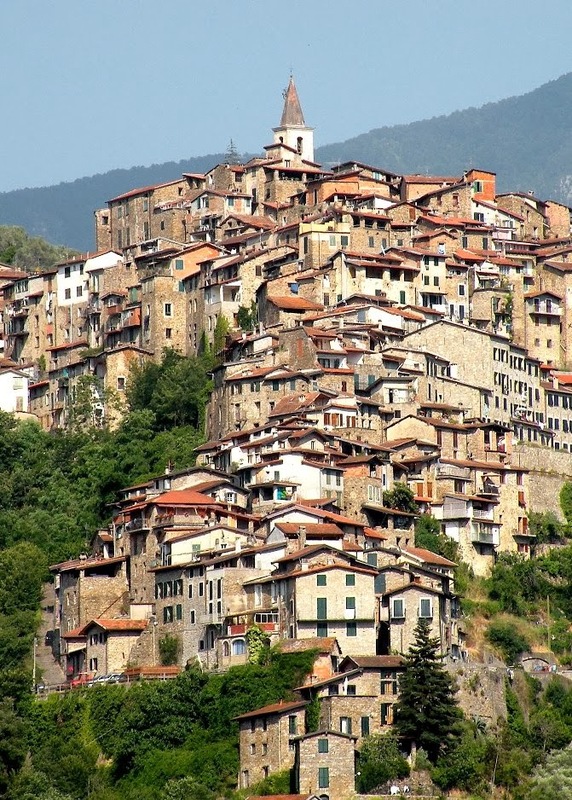 This extraordinary sight , unique among the "villages of stone" of pre-Roman Liguria...has been celebrated by poets and writers and portrayed by famous painters who have made Apricale particularly popular and loved by artists. The town preserves intact its urban structure and medieval atmosphere. The original nucleus is high on the hill, with the Castle, the parish church and the houses arranged in concentric circles. From the harmonious central piazza, two neighborhoods pour down opposite sides of the hill - all'abrìgu and all'ubàgu - that is to the south and north. 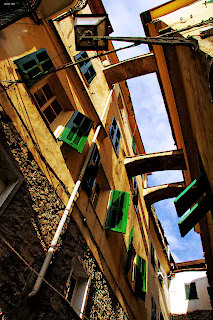 A maze of narrow streets (caruggi) and alleys surround the hill connected by steep stairways and walkways, as the road network has remained unchanged for a millennium. The tall stone houses, often joined together by arches, overlook the medieval network. This is the world of yesterday - impenetrable and reserved, but now available to the visitor to relive and to enjoy the lodging, dining and art workshops." 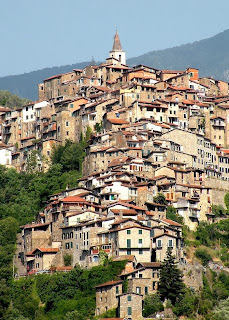 Apricale can be reached by bus Monday-Saturday from Ventimiglia on Linea 7. On the Riviera Trasporti Website click on Orario and then Orario Generale for the current schedule. There are about 5 buses a day. The town is an intriguing bundle of antique stone houses close together on a steep hillside. The village is webbed with circular little streets called chibi which run across the hillside 'a pigna' - which means like a pinecone. Many of the lanes are covered with stone vaulting, and you will definitely feel like a medieval pilgrim on these streets. Pigna is between the Maritime Alps and the sea almost at the end of the Nervia valley. Besides the old stony village, it's known for its stupendous views, its thermal spa, and for the nearby Park of the Ligurian Alps which has a Visitor Center here. While the town has Roman origins, the main development of the town was as a fortification in the 1100's with a castle at its highest point. The castle is now gone, but there's a loggia from the 1400's with good views nearby. Not to be missed in the rose-windowed Church of San Michele is a fabulous polyptych (more panels than a tryptych) by Canavesio from 1500 that is 14 feet high and 11 feet wide! 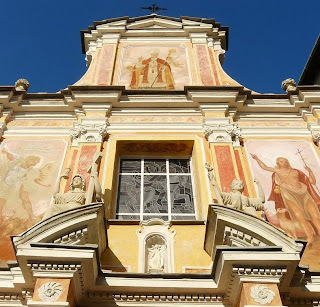 The Church of San Bernardo has recently restored frescos of the evangelists by Canavesio from 1482. The Pigna Comune Website (IT) is useful if idiosyncratic. Pigna can be reached by bus Monday-Saturday from Ventimiglia on Linea 7. On the Riviera Trasporti Website click on Orario and then Orario Generale for the current schedule. There are about 8 buses a day. This tiny village, population 323, has a sense of civic pride big enough for a large city - Seborga adamantly claims it is an independent principality! The claim goes back to 954 when Seborga's territory was ceded by the counts of Ventimiglia to the Benedictine monks, and never subsequently ceded. Not in the treaty annexing the area to Savoy's Kingdom of Piedmont-Sardinia, nor in Italy's Act of Unification of 1861. By 1963 the people of Seborga were sufficiently convinced of the independence argument to elect one Giorgio Carbone, a flower grower, as their head of state with the title Giorgio I, Prince of Seborga - also known as 'His Tremendousness'. Carbone's status as prince was furthered in 1995, when Seborgans voted in favor of the principality's constitution - and independence from Italy for good measure. Carbone reigned until his death in 2009, with the local bar as his throne room, and an enthusiastic welcome for travelers as his diplomatic policy. What’s not to like about a prince who adopted the motto: Sub Umbra Sedi (I sat in the shade)! The current Prince is Marcello I, elected in 2010, and his smiling wife might well greet you today. While the Principality may have only a symbolic value, it does issue coins and stamps that are legal tender in Seborga. This continues a local tradition originating in the 17th century, and all this is explained at the Museum of the Old Mint (Museo della Zecca Antico Principato). There is also a well regarded Museum of Musical Instruments (Museo degli Strumenti Musicali) located near the Town Hall. The 135 high-quality musical instruments from 1744 to 1930, are divided into aerophones, chordophones, idiophones, membranophones, and mechanical instruments. If you are not familiar with these terms, you would be the perfect visitor! The hillside village itself is small but picturesque, with tremendous views of the coastline. 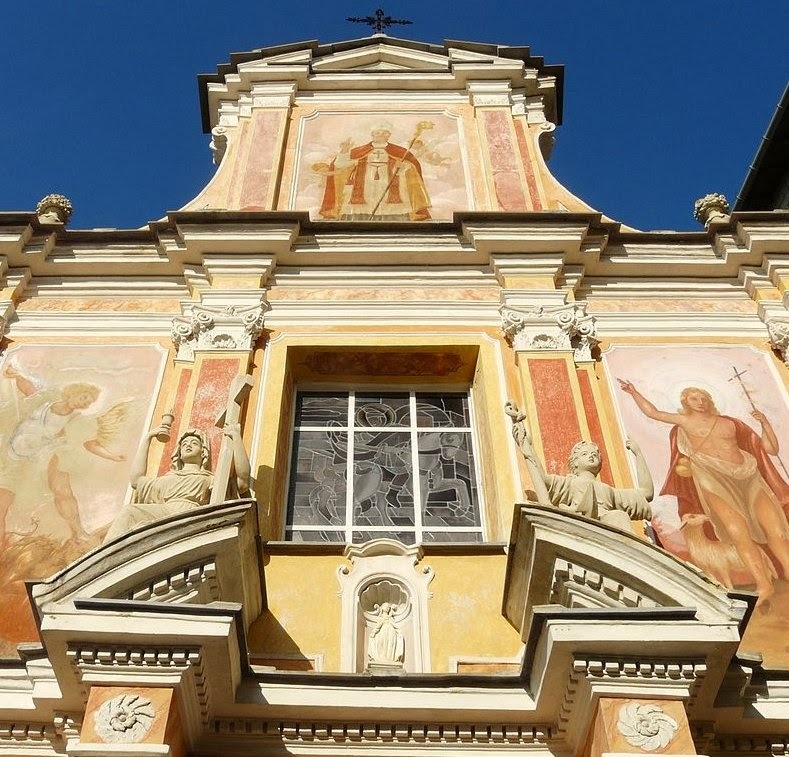 Besides the museums, there are two churches and a palazzo to investigate. At the entrance of the village, there is a small 13th century chapel dedicated to St. Bernard, one patron of Seborga. In the central square is the ‘new’ 16th century church of San Martino - the other patron - with a Baroque facade, recently restored. The church is modest in size, but churches just don't come any cuter than San Martino. Surrounding the churchyard is a sequence of arches and the entrance to a building called 'Palazzo'. Now privately owned, it was used by the Benedictines as a residence after they bought it from Seborga in 1607. 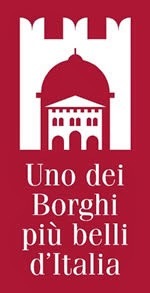 Seborga can be reached by bus Monday-Saturday from the Bordighera Train Station on Linea 10. On the Riviera Trasporti Website click on Orario and then Orario Generale for the current schedule. There are about 4 buses a day. Renting A Car in Italy We recommend the car hire broker Auto Europe where you can compare companies, get a low price guarantee, no deductible insurance, and cancel easily. Click here: Auto Europe.